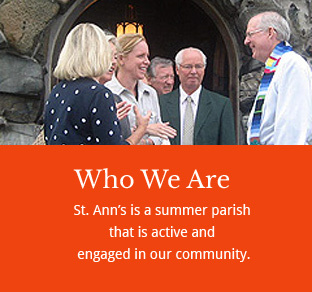 Welcome to St. Ann’s Episcopal Church! 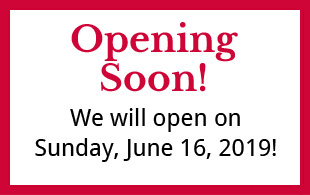 We are a summer chapel that opens the middle of June and closes on the last Sunday in September. 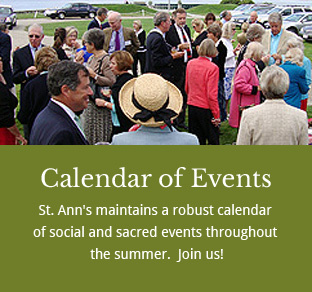 While we are a place of worship, we are pleased to welcome an estimated 20,000 visitors to the property each year. 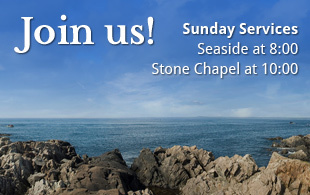 We hope you will enjoy the beautiful setting and find refuge in the quiet of our reflection garden, inspiration in the architecture and historical chapel, and rejuvenation while seated on the lawn overlooking the Atlantic Ocean and Kennebunk River. 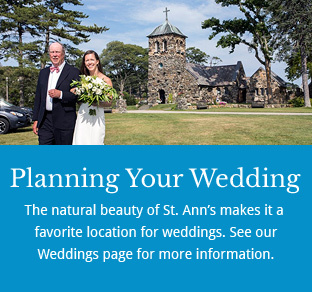 St. Ann’s is an active, vibrant parish where people from all faiths are welcome to participate in Sunday services. Please click here for information about worshiping with us. Generally speaking, visitors are welcome to visit the property Monday – Saturday from 9 AM to sunset and Sunday (if not attending worship services) from 11:30 AM to sunset. The Stone Chapel opens when the property does but usually closes around 5:30 PM. However, there are days and times each week, when the property and church are not open to the public because of wedding rehearsals and ceremonies, baptisms, and memorial services. If you are planning to visit on a particular day, please contact us to learn if there are any events planned that would limit your access to the church and/or property. Visitors are asked to wear shirts and shoes and refrain from smoking. You are welcome to picnic and we ask that you help maintain the property by taking all refuse with you. Our sexton, Reggie Sargent, is a wonderful ambassador and will be delighted to answer questions and share history about St. Ann’s. Limited parking is available while you are on the property. Please do not park your car and take a walk along Ocean Avenue. You might return to find the gates locked and we would hate to have you wait until the next morning to retrieve it. We welcome your well-behaved and leashed pets. Please be sure to take with you any “deposits” your pet might make on the grounds. Don’t be surprised if you encounter Josie, the church’s ambassador, during your visit. She patrols her domain regularly! The narthex is an historic term that refers to the entry area of a church. So why not use the word "entryway?" Using narthex is traditional and it clearly indicates we're talking about a church. Besides that, it's simply an interesting word! The nave is the main room of the church. It comes from the Latin word meaning "ship" because the vaulted church ceiling resembles a ship turned upside down and inspires the metaphor of the church as a safe vessel in which to sail through the stormy and uncertain waters of life. The Book of Common Prayer is a compilation of prayers for all variety of occasions, public and private, for individuals and congregations. It is used for baptisms, weddings, funerals, and many other church ceremonies. The overwhelming majority of them are drawn directly from Scripture. What is the purpose of attending church? There are 3 primary reasons: 1) to demonstrate the belief that God deserves our respect and love; 2) to learn through the readings and sermons how to apply Christian tenets in our daily lives; and 3) to experience community, and the support and inspiration that provides as we strive to honor God. What is the Anglican "three legged stool?" This is a metaphor for the Episcopal Church's fundamental embrace of Scripture, tradition, and reason. Episcopalians balance all three to understand and experience God.